Ellen Hayes, 94, of Exton formerly of Lititz and West Chester died Friday, October 5, 2018 at Sunrise of Exton. Born in Philadelphia, she was the daughter of the late James and Kathryn Widmeier Burke and the wife of the late John H. Hayes, Jr. with whom she shared 62 years of marriage before his death in May 2007. She was a member of St. Peter Church, West Brandywine and a former member of St. James Church, Lititz and Sts. Peter & Paul, West Chester. 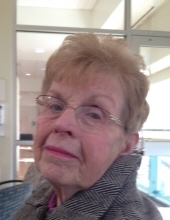 Ellen was a devoted mother and grandmother, she enjoyed knitting, reading, and doing crossword puzzles. Ellen is survived by her children: John Hayes (Connie) of Brentwood, NH, Ellen Cerritelli (Tom) of Coatesville, Thomas Hayes(Jeanne) of Lititz, and Kathleen Hayes Barker of Coatesville; 9 grandchildren and 12 great-grandchildren. In addition, to her husband, Ellen was predeceased by her son, Robert Hayes and 3 siblings. Ellen’s funeral mass will be celebrated Tuesday, October 16, 2018 at 11am at St. Peter Church, West Brandywine with visitation beginning at 9am. Entombment will be held in St. Agnes Cemetery, West Chester. Memorials in Ellen’s honor may be made to Alzheimer’s Association or to St. Peter Church 2835 Manor Road, West Brandywine, PA 19320. To send flowers or a remembrance gift to the family of Ellen D. Hayes, please visit our Tribute Store. "Email Address" would like to share the life celebration of Ellen D. Hayes. Click on the "link" to go to share a favorite memory or leave a condolence message for the family.